New launches are driving sales in urban areas but automobile makers are facing a rural slowdown. According to industry estimates, the rural market contributed 15 per cent of automobile sales this year, down from 18 per cent a year ago. Delayed sowing of the winter crop after a deficit monsoon have accelerated agrarian stress in the last two years. Rural incomes have also declined as food prices have come off. R C Bhargava, chairman of India’s largest car maker Maruti Suzuki, says a drought does not necessarily mean that rural sales will collapse. But rural sales do slow down with every sign of agrarian stress. Maruti reported a 25 per cent growth in rural sales in April-September 2014, which has slowed down to 10 per cent this year. Maruti’s rural focus over the last seven years has helped countryside sales grow to 34 per cent from 3 per cent. “The rural market accounts for almost one-third of the small car demand and also contributes to demand for compact sedans and utility vehicles. Almost half of the motorcycles are sold in the rural market. 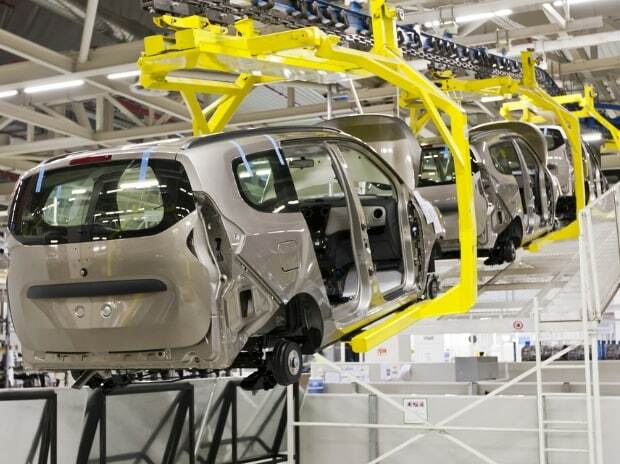 If this market does not perform, it will be all the more difficult for the industry to post a sustained recovery,” says Vishnu Mathur, director-general of the Society of Indian Automobile Manufacturers (Siam). Hyundai, which has 21 per cent sales coming in from the rural market, says its sales are growing at 14 per cent in both urban and rural areas. “We have increased the number of rural outlets from 320 last year to 333 now. We are running customer-focused finance schemes and have been able to maintain the rural contribution,” says Rakesh Srivastava, senior vice-president and division head (sales and marketing), Hyundai. The countryside’s contribution to passenger vehicle sales had climbed in recent years, helped by employment generation schemes, a surge in land prices and increases in support prices of crops. These triggers created a strong base, however, growing from that base is an uphill task for the automobile industry. The stress is most visible in tractors sales, which have grown at a compounded average rate of 7 per cent over the last 20 years, and between 2010 and 2014, the rate accelerated to 16 per cent. In the first half of 2015-16, tractor sales have declined by 20 per cent. “The Indian economy continues to recover, albeit at a slow pace as contracting exports and weak rural incomes weigh heavily on growth. A good rabi crop will play an important role in boosting agricultural incomes and improving rural demand,” Mahindra & Mahindra said in its outlook early this month. Hero MotoCorp, which has a large rural footprint, saw sales in the second quarter decline by seven per cent year-on-year and 4.3 per cent quarter-on-quarter. Motorcycle sales overall declined by 2.57 per cent in April-October. Explains IIFL in a note, among two-wheeler companies, Hero has the highest exposure to the vulnerable segments, namely, economy and executive motorcycles, followed by TVS Motors’ mopeds and motorcycles. The exposure is the least for Eicher. “Only half of the rural customers are farmers and the rest are those contributing to the rural economy. We are rolling out micro marketing and are targeting key customers like farmers, salaried employees and small businesses. We expect our rural revenue share to be about 30 per cent in the near term”, said a Tata Motors spokesperson, adding the rural contribution crossed 20 per cent (during April-October period) this year against 15 per cent in FY15 without sharing the current growth rate. Most automobile makers expect a recovery in the second half of the financial year. The government has announced steep increases in support prices for pulses and oilseeds and a comparatively lower increase for wheat. But lower productivity takes away the benefit of higher support prices. Moreover, the situation is not bright for all crops. In the largest sugarcane growing state Uttar Pradesh, where mills purchase cane worth over Rs 20,000 crore in a year, farmers are not likely to see an increase in price for the third consecutive year. Uttar Pradesh happens to be the second largest market for passenger vehicles. The fact that the rural market is not doing well is visible in sales of utility vehicles, a sought-after segment in the countryside. 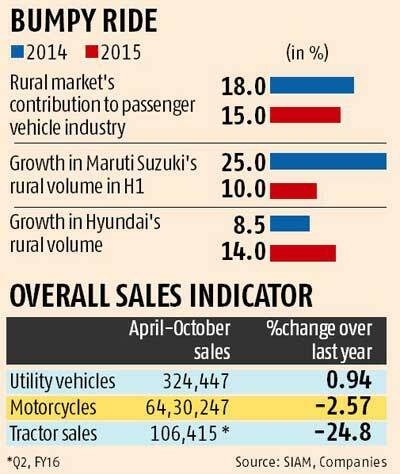 In April-October, sales of utility vehicles grew by less than 1 per cent. By comparison, sales of cars grew by 11.51 per cent. An industry executive explains that most of the new launches this year—Creta, Jazz, S Cross, Baleno and Aspire--are focused on the urban market, which is growing at 7-8 per cent vis-a-vis the 2-3 per cent growth in the rural market. The challenge of rural economy is also visible in motorcycle sales that declined by 2.57% in April-October period. Decline has been also prominent in tractor, considered a barometer of the rural economy.